Flexibility and Design: Learning from the School Construction Systems Development (SCSD) Project, the first book by Assistant Professor Joshua D. Lee, PhD, AIA was published by Routedge this past month. 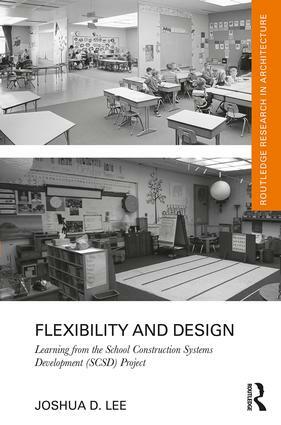 This book questions flexibility as a design approach by providing a longitudinal analysis of an innovative architectural experiment called the School Construction Systems Development (SCSD) project. The SCSD pioneered the use of performance specifications to create an open, prefabricated, and integrated system of building components that provided four modes of flexibility. Educational facilities throughout California used the SCSD system and it spawned a variety of similar projects throughout North America. This book traces the development and subsequent use of the system over 50 years through archival research, personal observations, re-photography, re-surveying, plan evaluations, interviews, and an advertisement analysis. These new findings provide useful insights for architects, educators, historic preservationists, and others about the affordances of spatial flexibility, the difficulties associated with technological transfer, the impact of unstable market conditions, the importance of user input during the planning process, and the need for long-term social relations to sustain architectural experiments. Joshua joined the School of Architecture this past year as an Assistant Professor; he also serves as the Co-Track Chair for the Master of Science in Architecture–Engineering–Construction Management (MSAECM) program.